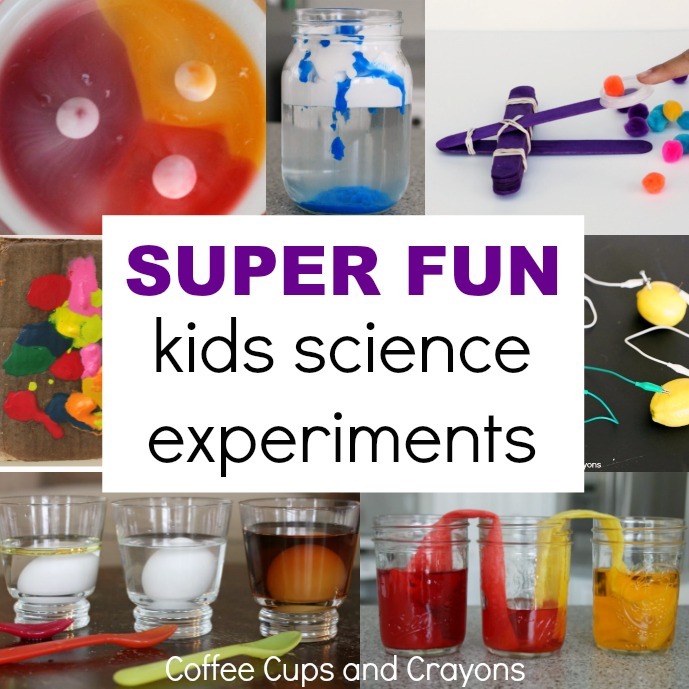 There is nothing like a cool science experiment to get kids excited about learning something new. 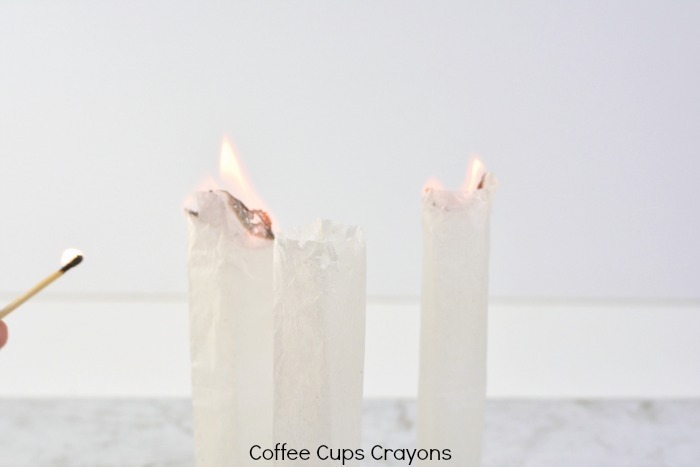 This flying tea bag experiment has to be one of the most fun ways to teach kids about heat energy–between the fire and flying they are sure to be captivated. It’s also way easier and less messy than you think! *Adult supervision is advised at all times. Only adults should handle matches and conduct this experiment for kids to watch. Conduct this experiment on a metal or stone surface. Make sure that you have enough space above the surface for the tea bag to float up and extinguish itself. Open the tea bags, and carefully unfold them. Empty out the tea leaves into a small bowl, and save them for use in other ways if you like. Tea leaves make great garden compost! 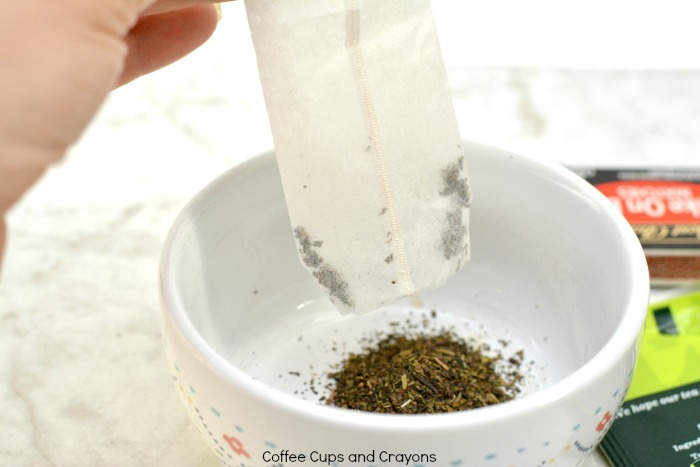 Hollow out the center of the tea bags with your fingers, and stand them up on end on the solid metal or stone surface. With a match, quickly light the top tip of each standing tea bag. Watch as the tea bag burns to the bottom, and then quickly floats up into the sky. See the flying tea bag experiment in action! The flying tea bag experiment is really a heat experiment masked as a super cool trick. As the flame burns is heats the air inside the hollow center of the tea bag. As the air gets hotter the molecules become less dense and move around. The less dense warmer air rises above the more dense cooler air around the tea bag. Since the tea bag is so light it rises with it and appears to fly. This is a fun, hands on way for kids to see how heat effects air molecules. 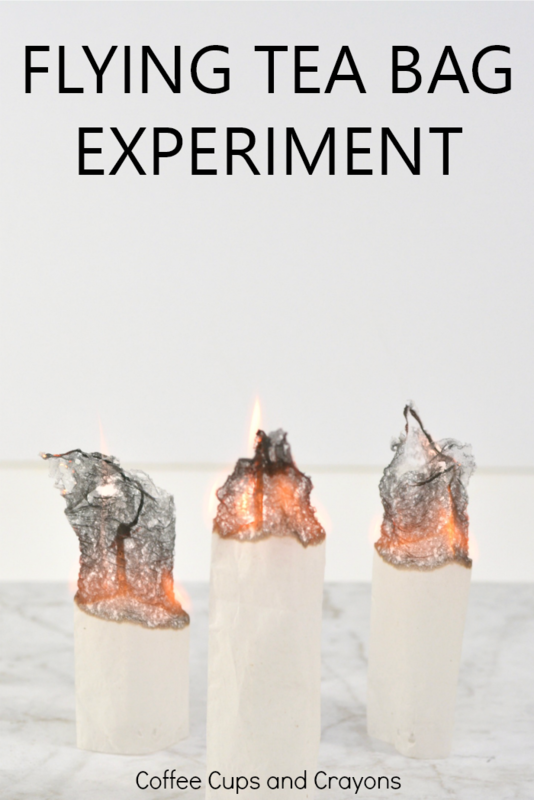 If you like this one you’ll also want to try A Simple Heat Experiment too! You only need a couple supplies and it helps kids visualize how temperature can change how air and water molecules react. But don’t let the fun and discovery stop there!